We have been going to El Salvador three times a year since 2004. We collaborate with The Salvadoran Rural Health Association (Asaprosar) in Santa Ana. On the first trip, we performed in most of the twenty-five Pre-Schools Asaprosar has built throughout the country. 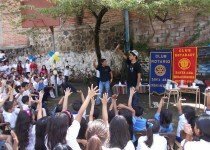 After those performances, the founder-director of Asaprosar, Dr. Vicky Guzman de Luna, asked if we would teach some magic tricks to a group of children who were doing particularly well in school. These children participate in a program called “The Barefoot Angels.” A few years earlier, many of these children had been living and working barefoot in a garbage dump (see below) After spending a day with this group of children teaching them magic tricks, a fourteen year-old boy named Jaime Zumba asked Tom, “When are you coming back?” We had no plans to come back or not to come back. Tom thought for a moment and responded, “How’ bout May?” “Great,” Zumba shouted. Since then we have traveled to El Salvador three times a year. We have continued teaching the Barefoot Angels magic and a number of them have become marvelous performers. Each January we sponsor a week long sleep over Theater Art and Magic Camp (see below). Since September 2009 two young New York magicians, Devonte (Roque Rosero) and Six (Michael Muldoon) see website on Our Team page. 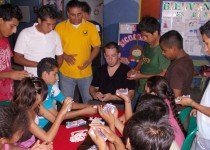 have gone to El Salvador three times a year performing and teaching the Barefoot Angel magicians. Devonte and Six are like big brothers or young uncles to the Salvadoran magicians—they have been an amazing addition to the El Salvador program. 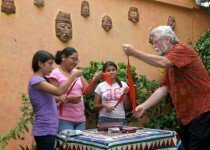 One of the many marvelous things they have done over the years is take six of our young magicians to FLASOMA—the International Meeting of Spanish Magicians held in Guatemala City in 2010. What a fantastic opportunity for our young magicians to sit, talk and learn from international superstar magicians like Juan Tamariz, Daniel Ortiz and Rafael Benetar. FLASOMA was a life changing experience for our magicians. 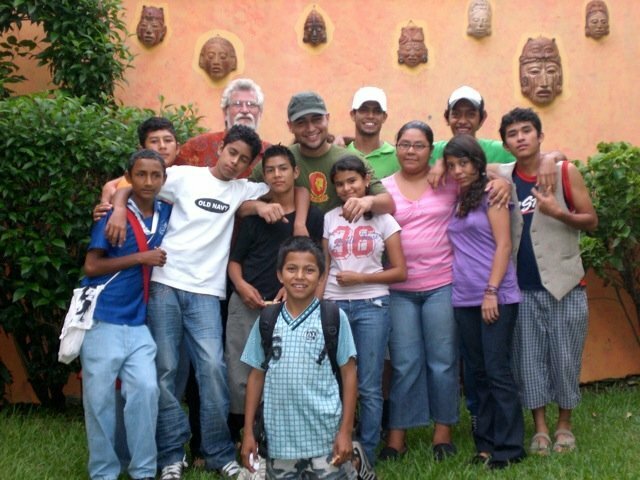 Devonte and Six also do most of the teaching and organizing of performances in El Salvador. 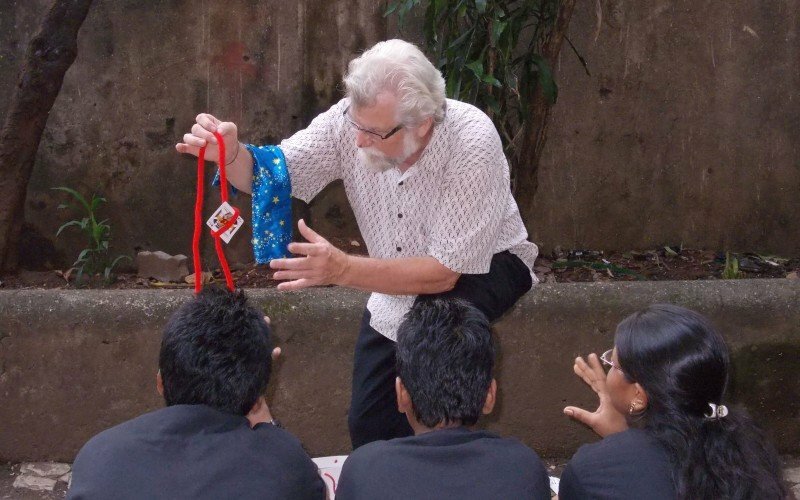 Because of their commitment to the El Salvador program, Tom was able to begin the program with Prerana in Mumbai, India. 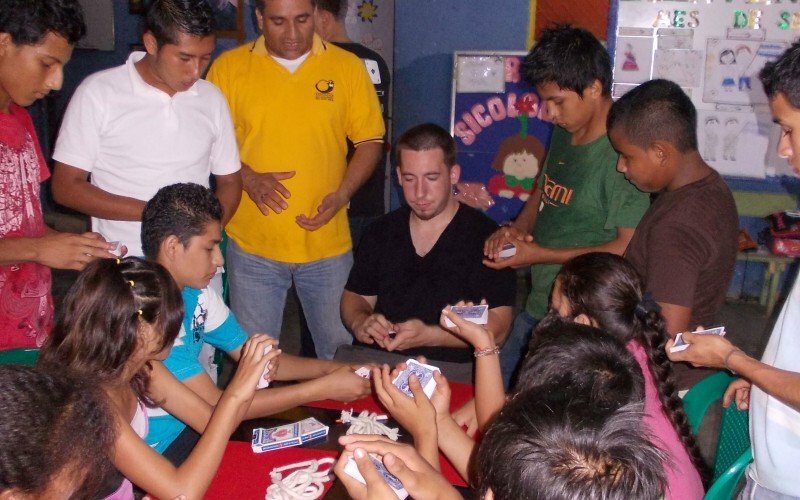 This trip to Guatemala was a dream come true for both the young Salvadoran magicians and us. From our first meeting we have told these young magicians our dream is that some day, if they continued to develop as magicians and do well in school, they would travel with us to the refugee camps and orphanages around the world. Hopefully this trip to Guatemala will be the first of many trips. 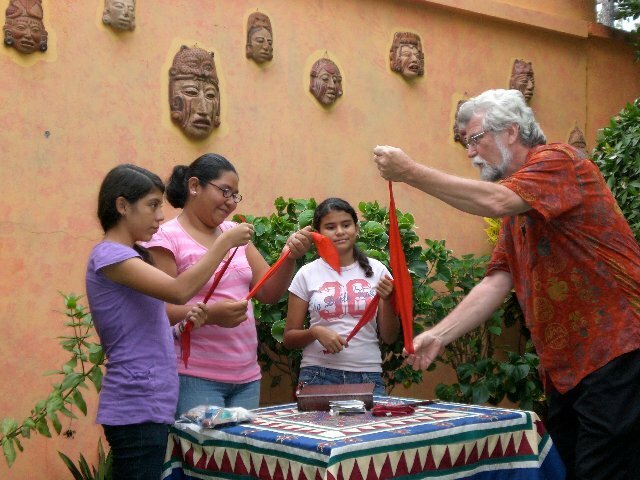 In January 2010 Maricela and Astrid, two of the young girl magicians, went to Guatemala and performed for thousands of Mayan children in the Highlands around Lake Atitlan. A most amazing moment happened at Valle de Norte during this trip with Maricela and Astrid. link to Miracle at Valle de Norte. Many marvelous things have happened since 2003 in El Salvador. One of the most wonderful things is that dreams have begun to awaken within these young magicians. We like to think that magic makes the impossible seem possible. At various times these children would say to us, “I want to be a nurse,” “I want to be a veterinarian,” “ I want to study computers.” In response to these awakening dreams, to the passion and grit of these children and to how well they were doing in school, we created The Barefoot Angel Magicians Scholarship Fund (link to How You Can Get Involved) The junior and senior years of High School in El Salvador cost $450/year, an impossible amount for the struggling families of these children. The Scholarship Fund is currently paying for a half dozen high school scholarships and two post-secondary students. Wendy graduated from Nursing School. 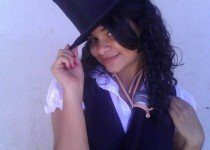 Jaime Zumba completed computer studies at the best electronics institute in Santa Ana. These children are making their dreams come true. These are dreams they could not even dare to dream when they were living and working in the dumps of Santa Ana. 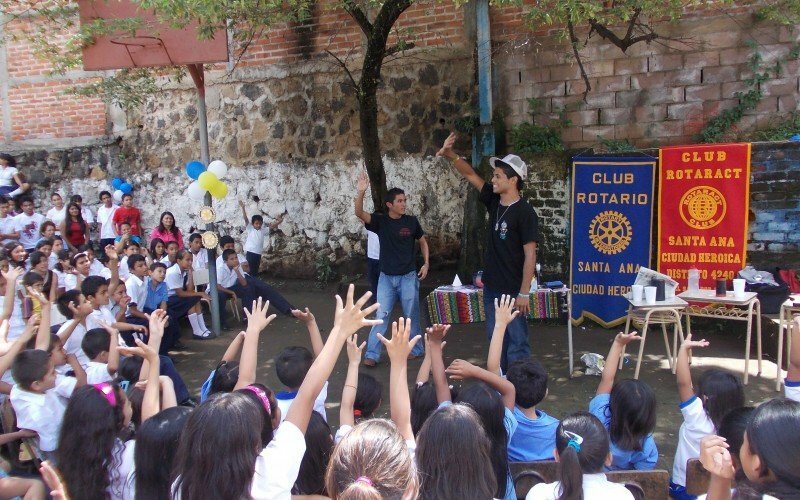 We are thrilled with what these young magicians are doing in El Salvador. They amaze us all the time. The atmosphere in the cab of the bouncing pickup truck was silent and serious. We all sat there knowing that something marvelous had just happened. 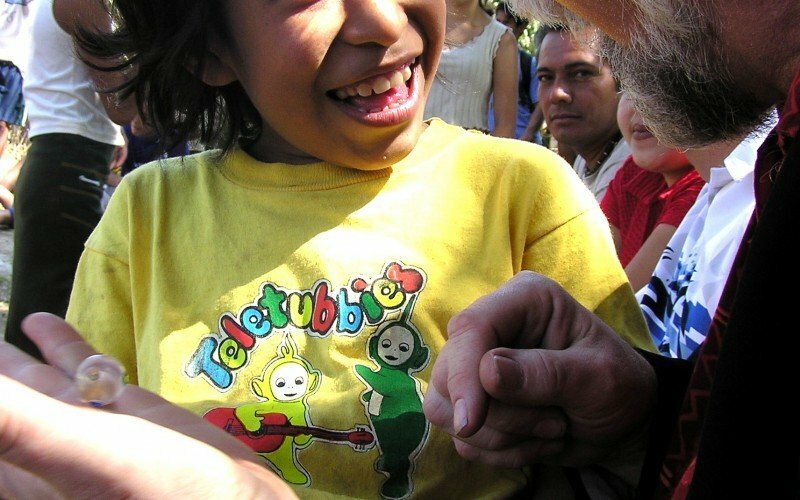 Miriam broke the silence, “Time has been changed for those people, now time will be seen as Time Before the Magicians Came and Time After The Magicians Came.” We had just performed a magic show for the children and adults working in the Chalchuapa Garbage Dump. These people work long days in this desolate dump, a grey/black landscape of smoldering plastic and rotting rubbish, scrounging for scraps of aluminum and food, anything they can salvage, sell or eat. Miriam had wanted to simply show us how some of the children in El Salvador are forced to live when she suggested we drive down the long road into the vast landscape of rot and desolation. Once we saw the wild pigs, dogs and vultures, children and adults rooting around in the rubbish, it was clear we needed to do a magic show for these people. The pickup truck drove down the long rutted road the garbage trucks follow to dump their loads. Often young people climb up into the bed of the trucks to have first pick of the load. Some children have been buried alive under the garbage if they slip and fall while the truck is dumping its load. When we were deep into the dump, we got out, put the tailgate down and set up our props and began to perform. Folks started to gather around wondering what was happening. As I waved a red silk in the air and ran it through my fingers, it was clear something was about to happen. They watched and when I opened my hand and the silk had vanished a wave of wonder and laughter went through the gathering crowd. With each trick, the excitement grew. Rob did a wonderful routine with the multiplying rabbits in the hands of one of the children. I ended, as I often end, taking a long piece of white paper and began to tear it to shreds. One by one the pieces went into my mouth and slowly I began to pull a long chain of linked pieces of white paper from my mouth and then the paper turned into a 45 foot rainbow streamer that seemed to pour endlessly from my mouth. The audience began to squeal with delight. One woman, who might have been thirty-five or fifty-five, began to laugh and smile as she jumped up and down clapping with delight. I went over to her and decorated her with the rainbow garland. As Miriam said later in the day, this woman embodied in her enthusiastic delight the joy the crowd was feeling as the show came to an end and we slowly shook hands and bid them farewell. Time has been changed, before and after the magicians came to the garbage dump. That’s certainly true for me. We brought magic to the people–people who will probably never go to a movie or a concert, a dance performance or a play. The poorest of the poor who often feel trapped in their lives. What I really remember from the Chalchuapa Dump was a boy, maybe 14 years old, stripped to the waist, covered with gray ash, wearing dirty gym shorts and flip-flops. His thin supple ash covered body seemed like a Sahdu in this world of waste and desolation. His body was strong and proud as he watched the show, hands on his hips, eyes bright and alive. What an inspiration to see such a shimmering soul in that stinking dump. A beautiful flowering soul in a world of waste. I hope I touched him as much as he touched me. Perhaps he now feels magic is alive, the impossible is possible. Dreams might come alive and flower in his imagination. Like some Houdini of the imagination he might escape the Chalcuapa Dump and, as Eloise from Asaprosar said later, “Perhaps that moment of magic he felt during the show, that the impossible is possible, perhaps he will keep looking for that in his life and make it happen.” He might find that in his life, the impossible is possible. This is certainly my hope and the dream of Magicians Without Borders. We had already been in the Highlands of Guatemala for almost a week. Maricela and Astrid had done two or three performances a day. They had performed for almost 2500 children in the villages around Solola and Lake Atitlan. They have created a most entertaining and engaging act and the two of them work together so well. The energy between them is that of good friends having a wonderful time making magic and laughter for their delighted audiences. On the next to the last day in Guatemala, Maricela and Aztrid were scheduled to do an early morning show in the small village of Valle de Norte in the mountains above Solola. 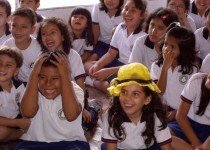 Alberto Palacios, an architect who has built almost twenty schools for the Mayan children in the villages around Solola organized many of the shows in the new schools. Alberto uses many Mayan design elements in the schools and they are simple and beautiful structures with bright traditional Mayan designs inside and out. Alberto designed a lovely small three-room school for the children of Valle de Norte. The village is somewhat isolated and never had a school. A few of the village children walked ten miles to the nearest school. The school would be opening in a week and today’s show was a celebration of the new school. Alberto Palacios said that the children in Valle de Norte had never seen a live performance before. 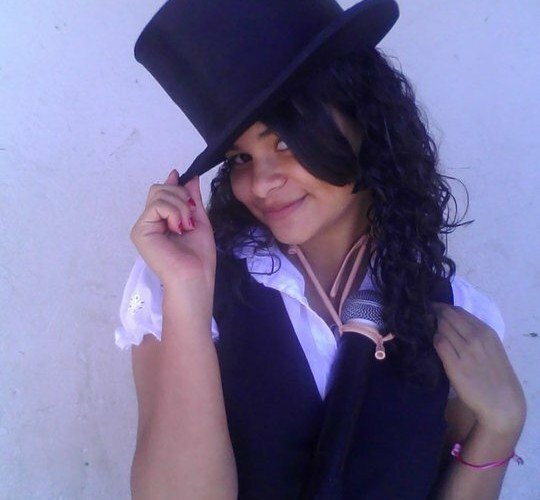 Maricela’s and Astrid’s magic show would be their first live performance. Something that is important to say is that for two girls to be performing in the male dominated, machismo culture of Latin America is a rare and startling thing. The impact on their audiences is palpable. The audiences are amazed at their skill, grace and courage. We wound our way up into the mountains and then down a steep rutted road into Valle de Norte nestled in a beautiful mountain valley. The workman were finishing uplast minute details getting the school ready for opening day. The girls set up in one of the classrooms and about one hundred children and thirty or so adults filled the room. The show was marvelous, the audience was spell bound. The men standing in the back with their arms folded were initially reticent and didn’t seem to know quite how to respond. But within ten minutes they were laughing out loud at how the girls interacted with the audience and they were clearly amazed at Azstrid’s and Maricela’s mystifying magic. This is the kind of impact these young women can have on an audience. They are growing into strong young women –graceful, talented, very funny, beautiful young women who are living a life on the edge of possibility. 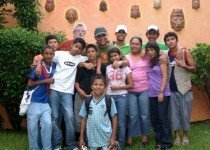 Since 2005 we have sponsored a week-long sleep over camp every January for about 50 of the Barefoot Angel children. To spend a week in a beautiful, safe, peaceful place laughing and learning is a wonderful thing for these children who live in grinding poverty surrounded by brutal gang violence and working long hours when they’re not in school. Campamento is a relaxing and refreshing week where these kids play hard, learn new skills, deepen friendships and create marvelous memories that nourish them all year. The day begins at sunrise with yoga and meditation on the shore of a beautiful volcanic crater lake. To see the rising sun on the faces of these children stretching and sitting in silence is a beautiful sight and a wonderful way to begin our days. After breakfast we have a check-in morning meeting before the first learning session from 9-10:30. The kids choose two of the three main offerings, art, theater or magic. They do one in the morning and one in the afternoon. After a mid morning snack, all the kids gather for an hour and a half Health and Leadership class. This is an opportunity for the kids to explore issues related to healthy minds and bodies, and develop relationship and leadership skills. 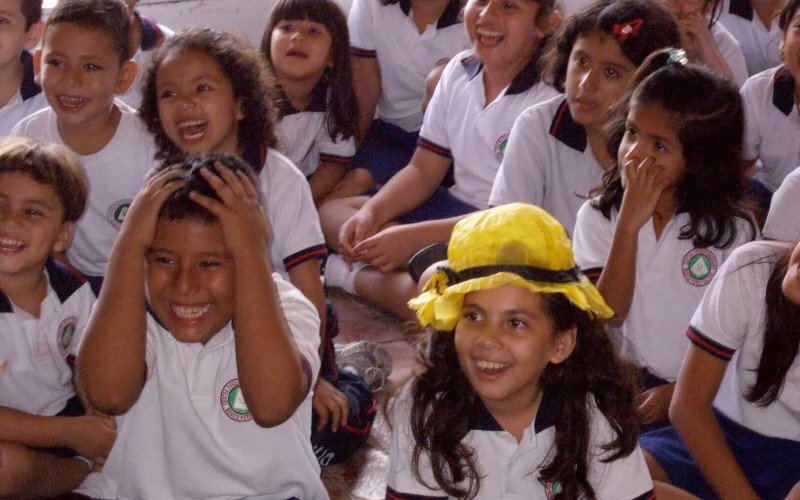 Becoming leaders in their communities is one of the main goals of The Barefoot Angel Program. After lunch, there is a soccer session run by Ben Gucciardi from Soccer Without Borders. Ben brings international soccer players to Campamento to work with the kids to develop the skills needed to be a good team player. Soccer is a national passion in El Salvador and Ben is a master at using soccer to teach important life skills and have lots of fun in the process. The afternoon ends with another art, theater and magic session from 4:00-5:30. There is also free time in-between when the kids relax or squeal with delight playing in the swimming pool. In the evenings there are group activities, dancing, singing, performances by the staff, campers or guest performers. The last night of camp is a tearful, joyful night of show and tell and all the campers receive a new backpack filled with school supplies. Campamento ends just before they start back to school after their summer vacation. This fund filled week is a wonderful way to end the summer and head back to school refreshed and renewed. Campamento is a wonderful week for all of us. In addition to being lots of fun, it provides the time and space for the magicians to learn and practice new magic routines and working with acting coaches they develop their performing skills. Our goal is not to create professional magicians (even though that seems to be happening with a couple of our magicians). Our goal is to use the magic to help these kids develop as people. 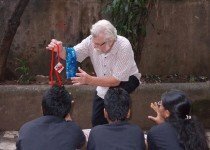 Learning and performing magic they learn discipline and creativity; they develop self-esteem and confidence. They learn to tell stories and create imaginative routines. They learn to perform with poise and presence. These are skills that serve them well as they navigate through their difficult and demanding lives. They tell us the magic has helped them become more active, involved, creative and successful students in school. Campamento has become an important part of the work we are doing in El Salvador and we imagine it continuing for a long time.